600 pages | 11 Color Illus. | 230 B/W Illus. Membranes are an energy efficient separation technology that are now the basis for many water treatment and food processing applications. However, there is the potential to improve the operating performance of these separations and to extend the application of membranes to energy production, gas separations, organic solvent-based separations, and biomedical applications through novel membrane materials. 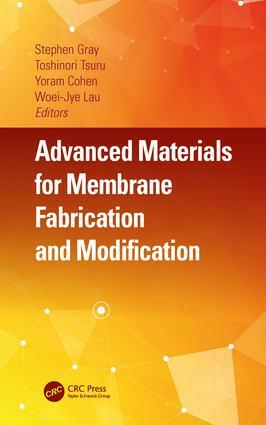 This book contains 20 chapters written by leading academic researchers on membrane fabrication and modification techniques and provides a comprehensive overview on the recent developments of membrane technology. Membranes can be manufactured from a range of materials including polymeric compounds, and ceramic materials, and both these materials are considered in the book. There are 5 chapters on water and wastewater membranes that cover the fabrication of thin film (TFC) composite membranes for nanofiltration(NF)/reverse osmosis (RO)/forward osmosis (FO) applications, stimuli responsive membranes, electrospun membranes, porous ceramic membranes, and polymeric ultrafiltration (UF) manufacture and modification. There are another 6 chapters on gas separation that consider carbon membranes, zeolite membranes, silica template and metal oxide silica membranes, TFC membranes, silica membranes, and metal organic framework (MOF) membranes. Zeolite membranes are also considered for organic solvent applications, as are solvent-resistant membranes manufactured by phase inversion, ceramic-supported composite membranes, and ceramic NF membranes. The emerging areas of membranes for energy and biomedical applications have 3 and 2 chapters, respectively. Energy applications consider ion exchange membranes for use in fuel cells, membranes for electrodialysis, and membranes for use in microbial fuel cells. For biomedical applications the chapters focus on hemodialysis membranes and redox responsive membranes. Dr. Stephen Gray is currently executive director of Institute for Sustainable Industries and Liveable Cities at Victoria University, Australia. He has had a focus on water and membrane research for over 25 years, and was part of the CSIRO teams that developed MIEX™ resin and that conducted the Melbourne Water Climate Change Impact study. He has established Victoria University’s water research program that includes water treatment, water resource management, IT, ecology, psychology and economics; chaired Victoria University’s water program’s Industry Advisory Board and was a board member of Water Research Australia for 6 years. He is part of research teams that are working towards commercialisation of membrane distillation from Victoria University research, have introduced ceramic membranes to Australian water authorities via a demonstration trials, and is working towards commercialisation of membrane integrity monitoring technology for reverse osmosis and ultrafiltration membranes from research conducted for Water Research Australia Limited. He also worked with the gas industry to develop silica removal and management technology for coal seam gas brines. In 2013 he was recognised as Thought Leader in Lux Research's international review of water research, one of only 30 international researchers recognised as such. He is known for his research on membrane distillation, organic fouling of low pressure membranes and high recovery reverse osmosis systems. In the field of membrane fabrication, he has projects that span nanocomposite ultrafiltration membranes for increased abrasion resistance, nanocomposite pervaporation membranes for niche applications, ceramic membranes for desalination, and small pore size metal membranes. Dr. Toshinori Tsuru earned his Dr. Eng. in 1991 from University of Tokyo, Japan. After working at University of Tokyo and Hiroshima University as a research associate and an associate professor, respectively, he was promoted to a full professor in 2006. He was a principal investigator of CREST (Core Research for Evolutionary Science and Technology) for development of ROBUST reverse osmosis/nanofiltration membranes for various types of water resources (Oct 2012- Mar 2017), and has been appointed as a distinguished professor since 2015 at Hiroshima University. His research interests are preparation of subnano-nanoporous membranes and their applications to gas and liquid phase separation. He has been working on membrane science and technology for more than 30 years from the viewpoints of materials science and chemical engineering. His research experience started with nanofiltration in terms of the preparation of polymeric membranes and the transport mechanism of electrolytes through charged porous membranes. His research on nanofiltration, including the theory and experiments on extended Nernst-Planck equation for permeation of single electrolyte and separation of mixed electrolytes, is one of the pioneering works, and have been cited more than several hundred times. After moving to Hiroshima University, his interest has expanded to inorganic membranes, including preparation and characterization of various types of nano/subnanoporous materials, mostly SiO2-based materials. His research group successfully fabricated high-performance silica-based membranes by sol-gel processing and atmospheric plasma-enhanced chemical vapor deposition. Recently, he has successfully developed a highly permeable hydrogen separation membrane with high selectivity. He also applied them to various separation systems not only in liquid phase such as reverse osmosis, nanofiltration, but also in pervaporation and gas separation. Based on the precise and reproducible measurements of permeation properties in single and mixed systems, he is an expert in the transport mechanism through nano/subnanoprous membranes. In addition, he proposed the permeation mechanism, the modified gas translation model, which enables the determination of pore sizes of subnanometer range. Dr. Cohen is a distinguished professor of Chemical & Biomolecular Engineering (CBE) at University of California, Los Angeles (UCLA) where he has been on the faculty since 1981. He is also on the faculty of the Institute of the Environment & Sustainability, Director of the UCLA Younes and Soraya Nazarian Center for Israel Studies, Director of the Water Technology Research (WaTeR), and co-founder of the UCLA/NSF Center for Environmental Implications of Nanotechnology (CEIN). He is a UCLA Luskin Scholar and holds the Rosalinde and Arthur Gilbert Foundation Chair. Dr Yoram Cohen earned his B.A.Sc., M.A.Sc., in 1975 and 1977, respectively, both in Chemical Engineering, from University of Toronto, and his Ph.D. in 1981 from University of Delaware. He is a recognized expert in the areas of water technology, water purification and desalination, environmental protection and sustainability, environmental impact assessment, and nanoinformatics. He has over 230 published research papers and book chapters, 400 conference presentations and 150 invited talks. Dr Cohen has contributed to policy and regulatory efforts focused on environmental protection and economics of water reuse and has an active program devoted to assisting disadvantaged communities develop safe drinking water resources. He developed and patented water treatment and desalination technologies, new membranes, in addition to software for environmental impact assessment. Dr. Lau is currently an associate professor at Faculty of Chemical and Energy Engineering, Universiti Teknologi Malaysia (UTM) and a research fellow at Advanced Membrane Technology Research Centre (AMTEC). He earned his Bachelor of Engineering in Chemical-Gas Engineering (2006) and Doctor of Philosophy (PhD) in Chemical Engineering (2009) from UTM. Dr Lau has a very strong research interest in the field of membrane science and technology for water applications. He has published over 100 scientific papers, 12 reviews and 10 book chapters and is the author of the book entitled Nanofiltration Membranes: Synthesis, Characterization and Applications published by CRC Press in Jan 2017. He is credited with 5 patents in the field of membrane science and technology with his collaborators from academia and industry. He wrote articles on the subjects of water saving and reclamation for newspapers and magazines at both national and international level. Dr Lau is currently the co-editor for Journal of Applied Membrane Science & Technology and has been appointed as guest editor for several peer-reviewed journals such as Journal of Engineering Science & Technology, The Malaysian Journal of Analytical Sciences and Chemical Engineering & Technology. Dr Lau has achieved many national and international awards since he started his career in 2009. These include Australian Endeavour Research Fellowship 2015, UI-RESOLV Program 2016 (Indonesia), Mevlana International Exchange Program 2017/2018 (Turkey) and Sakura Exchange Program 2018 (Japan).